This past weekend we had a birthday bash for my mother-in-law. My mother-in-law is a very sweet lady who has helped us out so much since having the triplets. Her and her husband have had a tougher than normal year over the past 12 months, so it was our pleasure to have a family cookout for her. The hubby and I were providing the meat, and my brother-in-law and his wife were bringing sides and dessert. Well, Saturday morning I opened up the refrigerator and noticed a bin full of assorted garden veggies that needed to desperately be used. We don’t have a garden, so I don’t can vegetables, but I knew that these needed to be eaten before they went bad. I hate throwing out perfectly good veggies just because I didn’t use them quick enough! I decided to make a simple pasta salad. 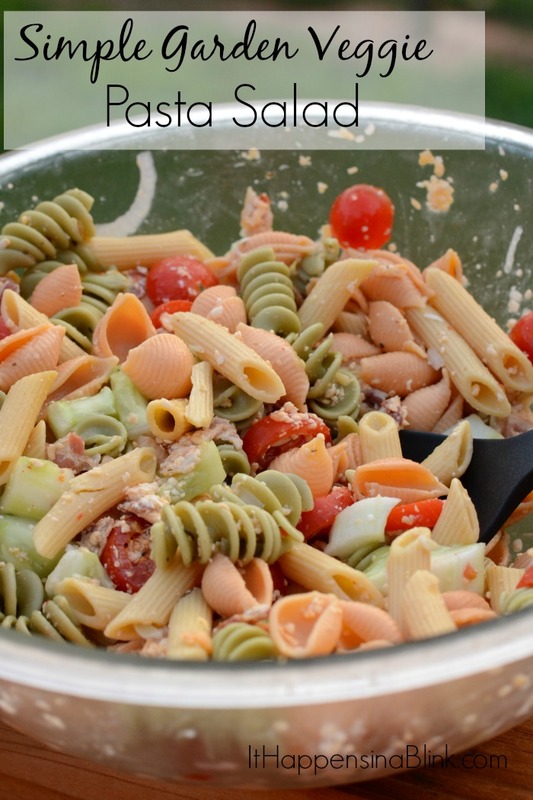 To me, pasta salad is a fun cook out staple. I love a bowl of good ‘ole pasta salad. For my hubby and daughter, pasta salad is a good reason to barf. They will not eat pasta salad no matter what I do. But this year, I have three more little people in my family who can hopefully be trained to like pasta salad. This Garden Veggie Pasta Salad recipe was my first attempt to see how this panned out. Read on for the recipe, and then find out if my little men are siding with me or their daddy! 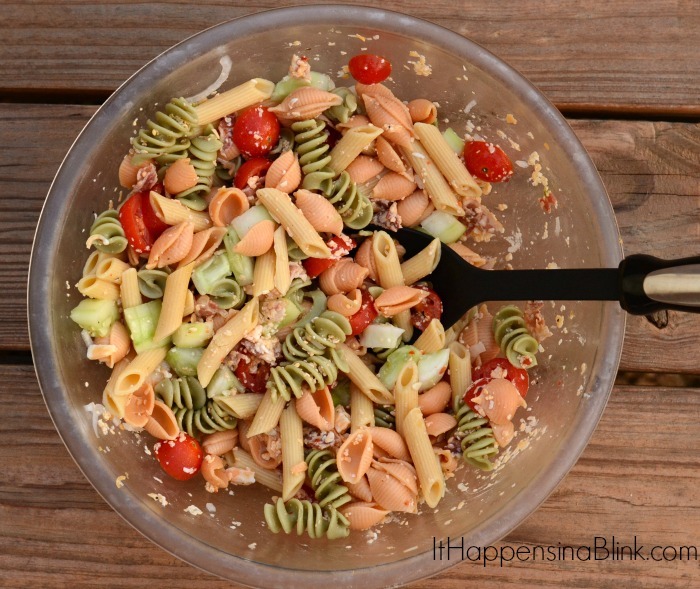 A generic pasta salad is also good for a potluck or church function. In this particular recipe, I am sharing the ingredients in quantities large enough to feed a large crowd for a gathering, cookout, etc. This recipe will feed approximately 25 people who are using the pasta salad as a side, provided of course that all 25 people like pasta salad and dish a big ‘ole heap on their plate. I am also splitting this recipe to make one batch that is “Veggie Light” for those who are not a fan of the veggies or for small children who may find the cucumbers to be a choking hazard. In a large bowl, combine half of the pasta, 3/4 of the tomatoes, the onion, cucumbers, 3/4 of the bacon, and 1 cup Italian Dressing. Toss until all ingredients are thoroughly covered. Place in the refrigerator to chill. In a large bowl, combine the remaining ingredients. Toss until all ingredients are thoroughly covered. Place in the refrigerator to chill. Simply toss all ingredients in a large bowl until totally covered by dressing. Place in refrigerator to chill until time to serve. As you can tell above, I did split the recipe. The boys didn’t get the onion-cucumber version. BUT I am pleased to say that they did like the Light Veggie version! Woohoo! I can officially make a big batch of pasta salad now and have someone with whom to share it! Adapt this recipe to fit your tastes and to use whatever veggies that you may be harvesting from your garden! This looks delicious! Pinning it! Thanks! It’s quick and easy! Ooooh,I LOVE pasta salad! I can’t imagine why someone wouldn’t! Yours looks so delicious. I never thought to add bacon! Yum! Pinning! Mmmm, Italian dressing and bacon…. bacon is my fave. This looks de-lish. Thanks so much for sharing at Inspire Me Wednesday. Featuring you in next week’s issue. OH, I LOVE pasta salad in the summer! Delish! We use almost exactly the same recipe but add shredded sharp cheese to it for a twist. Always an empty bowl at the end of the day! Not just a summertime anymore. All of my kids love this recipe. I bet they would like the sharp cheddar cheese twist!